@Grayt Apps Thanks a lot! 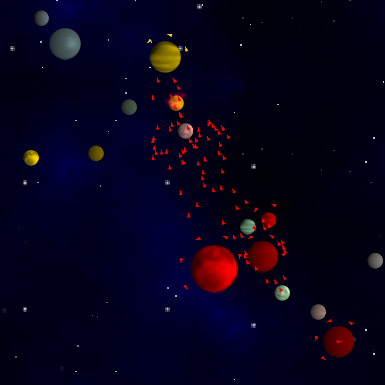 Super cool the way the planets move around! Excellent Job! @Arthur Scott Thanks a lot! Yes, the controls need certainly some more tweaking to work flawless. Nice work, reminds me of Auralux somewhat. 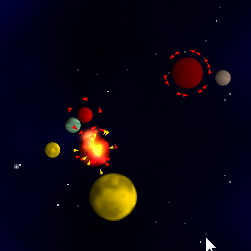 The mouse control needs a bit refining though, often in the heat of battle I couldn't seem to direct ships fast enough. @badlydrawnrod Thanks a lot for your kind words! We will certainly add a fullscreen option but we had some troubles with resizing the window and mouse picking shortly before submitting the game to the gamejam so we decided to support only window mode and only one resolution for the jam version. This is one of the more finished games in this jam, and that's saying something given that many of the games are good. This is excellent. I do wish there was a full-screen option as things seemed a bit cramped, but it's nail-biting stuff. Excellent! 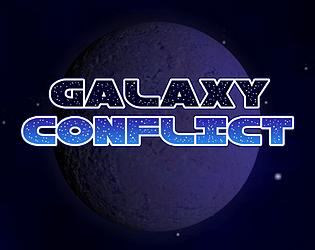 @JestDotty Thank you for your feedback, I am very glad that you like GalaxyConflict! The controls certainly need some more tweaking, especially the mouse picking which can really be tricky sometimes and keyboard controls. In my opinion controlling the camera with the mouse is a lot more convenient than with the keyboard. This is reminiscent of a game I played online vs players, called Intergalatic, back when I was little. Unfortunately doesn't exist anymore. Love the gravity/moving planets business though. Adds a new level of strategy. I think you are right, infrastructure takes too long in relation to the output. We will do more balancing after the jam. 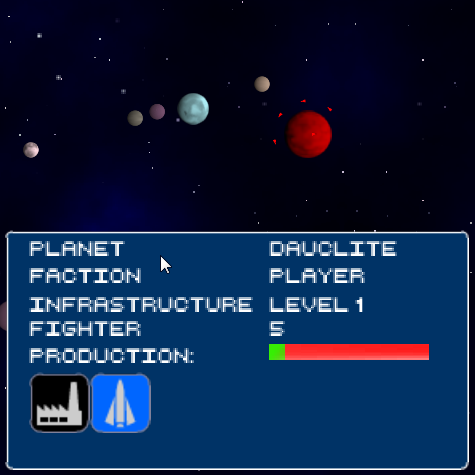 I followed the tip of the @Fivemedia and 'rush' to the planets around, I think the infrastructure takes a long time to upgrade and the level 3 don't spawn Fighters fast enough (I finished with 0 upgrades). It is very fun when you attack with 10+ planets at same time, haha. @mmachida Thank you very much! We want to continue developing the game after the Jam and one of the tasks on our list is to improve the notifications of such sneaky attacks. Great RTS game, still trying to finish, I was good in the game when it appears a group of purple that were dominating my planets one by one. I liked how you did the background in two different layers, nice effect when you move the camera. I'm really bad at RTS games, but still had a lot of fun! @Fivemedia: Thank you very much, I am very glad you like the game! Your tactics sound very good and promising! I have to try that. Most time I try to conquer the big planets as fast as possible to avoid that the enemies become to strong but most time I still get defeated. Key strategy seems to be take over planets fast early- let the big ones produce while raise the level of the little ones early, and then raise the big ones too....or maybe i just got lucky! Great game! You have to think along a lot of fronts at once! Very fun! Super fun. I was on the edge of my seat!